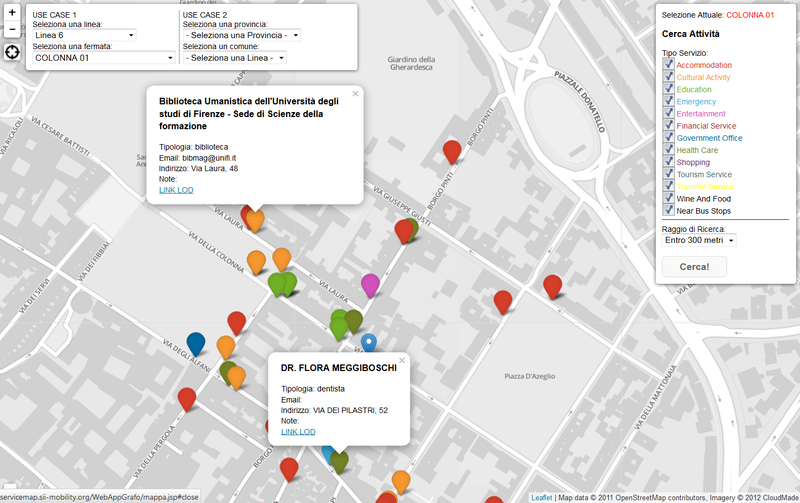 ServiceMap (http://servicemap.disit.org ) a map based query interface to access at the Transport Systems and Smart City Ontology and reasoning tools (get the document) populated by over than 300 open data coming from Florence, and Tuscany, about: trasportation, point of interest, services, educational instititions, bus stops, parking, and much more... The user may select the bus lines, and the sevice to discover the correlations and to access at the semantic model expressed and represented as Linked Open Graph. The servicemap is grounded on the km4city ontology goto the SMART CITY web page of DISIT to get additional information on km4city, service map API, mobile open source tools, etc.